A fine wingman who was a key member of the dominant Sandy Bay sides of the late 1970’s, Tony Martyn enjoyed great success with the Seagulls either side of a brief interstate career in Victoria and South Australia. Born in 1957, Tony Martyn’s football career began with Sandy Bay’s youth sides, winning consecutive Under 18’s Best and Fairests in 1974-75. He made his senior debut in 1976 aged 19, and in his first season he took the TANFL by storm, winning the E.C. Billett Shield as TANFL Rookie of the Year and playing a major part in Sandy Bay’s 73-point demolition of Glenorchy in the Grand Final. In the next two seasons Martyn’s star continued to rise, playing in a further two premierships in 1977-78 and winning the Seagulls Best and Fairest award in the second of those years. With already a serious reputation behind him, VFL scouts soon began approaching the youngster. It was Melbourne who eventually landed Martyn’s signature, adding to their already impressive group of Tasmanians that included ruckman Graham Hunnibell and veteran defender Ray Biffin. Martyn’s debut for the Demons came in the opening round of 1979 against Footscray at the MCG. The club would win only five games for the season however Martyn played in all of them, missing only five games for the year. He would also represent his state that season as a part of the Tasmanian side that participated in the 1979 State of Origins Carnival in Perth. After 12 games in 1980, Martyn was suspended after the opening round of 1981. He would play only two more games before announcing that he was quitting Melbourne, ostensibly because he felt he could no longer meet the demands of VFL football. Despite initial speculation that he would return home to Tasmania, Melbourne cleared Martyn to SANFL side Port Adelaide, where he would spend the remainder of the season. He would play 15 games for the Magpies under supercoach John Cahill, and was fortunate enough to play in the club’s premiership win over Glenelg. Martyn did indeed return to Tasmania at the end of 1981, lining up with original club Sandy Bay in 1982. As was the case in his first stint with the Seagulls, Martyn’s impact was profound and immediate, winning the Williams Leitch Medal as Best and Fairest player in the TANFL as well as his second Sandy Bay Club Champion award. He was also awarded the Lefroy Medal as his state’s best interstate player, sharing the award with New Norfolk ruckman and former Melbourne teammate Graham Hunnibell. 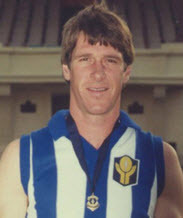 Martyn went back-to-back in both TANFL and club best and fairest awards in 1983, stamping his authority as the premier wingman in the state. His following few seasons were less noteworthy, and Martyn retired from TANFL football at the age of 29 at the end of 1986; unfortunately there would be no fairytale farewell, his final match being Sandy Bay’s unsuccessful Grand Final clash against Glenorchy. Post-retirement, Martyn played with and coached both Kermandie and Lauderdale, winning Best and Fairest awards with both. Such was the impact he made on the two clubs that when Kermandie and Lauderdale were both admitted to the SFL Regional League in 2002, they played off for the Tony Martyn Shield. Martyn’s greatest honours however came in 2001 when he was named one of Sandy Bay’s 25 greatest players, and the following year when the Tony Martyn Medal was inaugurated for Best Afield in the SFL Regional League Grand Final, which became the Gorringe-Martyn Medal upon the amalgamation of the Premier and Regional Leagues in 2009.